Former president and CEO of Institute for Healtcare Improvement, IHI, Maureen Bisognano, with CMO at Danish Lillebaelt Hospital Mads Koch Hansen, preparing for the international Stop Pressure Ulcer Day 2018. In Denmark, nursing homes for the most fragile elderly now reports more than 300 days between pressure ulcers grade 1 – 2. Pressure ulcers in grade 3 – 4 are very rare. Acute hospitals report similar results. Implementation of The Pressure Ulcer Bundle has had a great impact all over Danish healthcare. By means of improvement methods and a new “zero tolerance” for pressure injuries, many wards and units have succeeded in eliminating this kind of patient harm. Furthermore, a study has shown that eliminating pressure ulcers is not only beneficial for patients/citizens, it also saves money. Experts broadly agree on what it takes to avoid pressure ulcers; this includes pressure distribution, pressure relief, mobilisation and adequate nutrition among patients/citizens at risk. The Pressure Ulcer Bundle is a tool systematizing all these elements – in regard to all patients/citizens involved, every day. The Pressure Ulcer Bundle was first introduced in Danish hospitals 2010 and was very successful. Subsequently the bundle has been adapted for use in elderly care, and since 2013 it has been an important intervention in the Danish community-based elderly care, nursing homes and home care. In 2002-2008, Danish hospitals reported that between 13-43 % of patients had a pressure ulcer. These occurred in spite of hospital guidelines for prevention of pressure ulcers. Pressure ulcers were considered an almost natural, unavoidable complication when patients were bed-ridden or immobile. Wound-care nurses were busy, and extensive resources were spent on treatment of pressure ulcers and the resulting complications. This attitude was also reflected in the first study of the prevalence of adverse events at Danish hospitals in 2001, as pressure ulcers were not even included as an adverse event (1). A survey in Danish nursing homes in 1999-2005 showed, that 85 out of 141 residents (60 %) had pressure injuries at the time of admission. 25 (18 %) had severe injuries (grade 2-4). The survey also demonstrated room for improvement in prevention and treatment of pressure ulcers in nursing homes. The purpose of The Pressure Ulcer Bundle is to avoid pressure injuries, by introducing a systematic observation of and care for patients/citizens. The Pressure Ulcer Bundle first seeks to identify patients/citizens at risk of pressure ulcers. Each time a patient is in contact with the health service, it is assessed whether the person is at risk. If the answer is yes, the relevant measures are taken as described in the bundle (see below). Prevention of pressure ulcers for patients/citizens at risk covers pressure relief, mobilisation and adequate nutrition. In addition, the individual citizen is assessed systematically to ensure that early stages of pressure ulcers (red skin, pressure marks) are discovered early, so that action can be taken before the skin injury worsens. A patient/citizen first assessed to be outside the risk group may quickly change status. For example, the risk of pressure ulcers may increase in connection with deteriorating the person’s general condition, nutritional condition or level of functioning. Consequently, the pressure ulcer risk is re-assessed if the citizen’s condition changes. To reduce harm and mortality in hospitals the Danish Society for Patient Safety in 2010 introduced 12 care bundles as part of the Danish Safer Hospital Program* (2), including the Pressure Ulcer Bundle. Since then, The Danish Society for Patient Safety has worked together with strong stakeholders to reduce pressure ulcers. These stakeholders include the Danish foundation TrygFonden, Danish Regions, the Danish Ministry of Health and Local Government Denmark (the interest group and member authority of Danish municipalities). These improvement programs have been conducted with the assistance of The Institute for Healthcare Improvement, IHI. Part of the strategy for implementing the bundle in the hospitals was to set ambitious goals: hospitals were to achieve a 50 % reduction in hospital-acquired pressure ulcers during a 3-year period. However, this soon turned out to be not at all ambitious. In 2011, a Welsh expert team from the University Hospital Abertawe Bro Morgannwg, ABM, visited the Danish Safer Hospital Program and presented how, within a few years, they had succeeded in almost eliminating pressure ulcers at the hospital, which has 2,500 beds at four sites. As in Denmark the Welsh hospital implemented a “skin bundle” (Pressure Ulcer Bundle), using the model for improvement. But in addition, the Welsh hospital had introduced a new “zero tolerance” to that type of patient harm. Instead of being seen as a natural complication, pressure ulcers were now seen as preventable patient harm. If, on a rare occasion, a patient did develop a pressure ulcer, the event was analyzed to remedy any deficiencies in work processes. Danish hospitals implementing the bundle, also saw a change in attitudes. The ambition was no longer to cut occurrences by half, but to completely eliminate pressure ulcers in all categories. This kind of harm to patients was now seen as avoidable – it became ‘an adverse event’. During the first three years of intervention the five participating hospitals achieved considerable reduction in the occurrence of pressure ulcers. By working with the bundle in the improvement programs, the awareness of tissue damage in other places than the most common like on elbows and pelvis have been identified. New kinds of pressure injuries have been identified and included in the improvement work, for instance tissue damage to the nose from feeding tubes or damage to the ears caused by glasses. The Danish Sygehus Lillebaelt has worked with the Pressure Ulcer Bundle since 2010, and still keeps focus on this patient injury. At the weekly meetings between the hospital CEO’s and frontline leaders, new incidents of pressure ulcers are counted and discussed to learn from every episode. According to Sygehus Lillebaelt CMO, Mads Koch Hansen, Sygehus Lillebaelt with 650 beds has 40-50 new hospital acquired pressure ulcers per year. And the injuries are milder than before. Sygehus Lillebaelt has eliminated grade 3 ulcers, and now only sees grade 1 and 2. Another example is Nordsjaellands Hospital, where The Pressure Ulcer Bundle was introduced and spread from 2010 and on. Today, the incidence of pressure ulcers is lower than ever, with only three pressure ulcers occurring in the entire 576-bed hospital in October 2018. According to hospital CEO at Nordsjaellands Hospital, Bente Ourø Rørth, these results depend on continuous focus at hospital-level. As a part of the improvement work, data is collected to measure whether the bundle has any effect. This is done real time and locally in the units working with the bundle. Typically, the collection of data is based on frequent – for example daily – small samples. These measurements enable the frontline team working with the bundle to constantly monitor whether their efforts have an effect. Compliance to deliver care as planned is measured daily. For example, wards are measuring their compliance with step one in The Pressure Ulcer Bundle. Are they able to complete assessment of every new patient/citizen at the first contact/triage? Degree of compliance is measured regularly, e.g. every day or every week. The outcome measure shows the quality of care and the effect for patients. Since pressure ulcers is a rare event it is measured as days between newly occurring pressure ulcers. In each unit, the aim is to reach over 300 days without any newly occurring pressure ulcers in any category. About 125 units, including nursing homes and home care units, covering over 12.000 elderly citizens, have introduced The Pressure Ulcer Bundle. In November 2018, 59 of these units had – at least once – reached more than 100 days between newly acquired pressure injuries. 30 units had reached more than 300 days, which is the goal in the In Safe Hands program. In acute hospitals, home based care and nursing homes, The Pressure Ulcer Bundle was implemented using improvement methods. The improvement work was designed as breakthrough collaboratives (3) with strong commitment from the CEO’s, and frontline teams using improvement science, model for improvement, PDSA and real time data. A cost-effectiveness analysis of the Pressure Ulcer Bundle in the Danish Hospitals was carried out in 2013 (4). This study showed, that labour-intensive efforts (The Pressure Ulcer Bundle) to reduce pressure ulcers on hospital wards can be cost-effective and lead to savings in total costs of hospital and social care. Also, a cost-effectiveness analysis of the Pressure Ulcer Bundle has been carried out in the municipality of Sønderborg, one of the five municipalities working with the pressure ulcer bundle since 2013. The analysis indicates that using the Pressure Ulcer Bundle caused a 63% reduction in the incidence of pressure ulcers in the municipality. Furthermore, the overall costs associated with pressure ulcers in the municipality decreased, despite the expenses associated with improving care by implementation of the bundle (5). Cost-effectiveness analysis of the Pressure Ulcer Bundle in the municipality of Sønderborg, Aalborg University, Student Report, Autumn 2017. The Danish Safer Hospital Program 2010-2013 in five Danish Hospitals was a collaboration between TrygFonden, Danish Regions, and the Danish Society for Patient Safety. The program was delivered with expert assistance from the Institute for Healthcare Improvement, IHI. 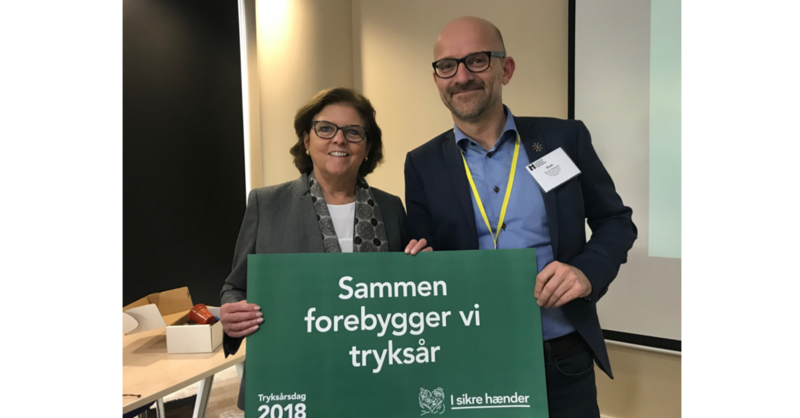 In Safe Hands, 2013 -, currently in 18 municipalities, is a collaboration between Danish Society for Patient Safety, the Danish Ministry of Health and Local Government Denmark (the interest group and member authority of Danish municipalities). The Pressure Ulcer Bundle contains assessments, planning and action, which together describe the best practice for preventing pressure ulcers. Has the skin been checked for pressure marks/ulcers on all of the body? Is the skin moist, for instance because of incontinence or sweat? Is the skin too dry? Is the citizen in pain? Are physical aids correctly set in relation to the citizen? Are physical aids used correctly in the bed, on the chair or in the wheelchair? Is there a need to re-assess physical aids? Is the citizen mobilised as well as possible? Is the citizen physically moved and placed on the bed correctly? Does the citizen have the planned food and drink intake?